It’s a fantastic feeling to actually get hold of the result of years of waiting and campaigning! Whether you win or not, soon you’ll experience the feeling of finally holding a copy of all the episodes in your hand! 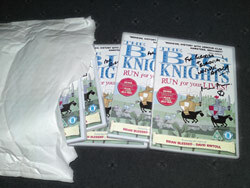 The covers of the prize copies are each signed by Mark Baker and Neville Astley. im really excited!!! hope i win! how many has entered the comp? I do hope that for your trouble you get to keep one of these Mr/Mrs/Ms Admin. You deserve one methinks!